National Cooperative Development Corporation (NCDC) is going to conduct written / Skill test for the posts of Junior Assistant (JA), Personal Assistant (PA), Sr. Personal Asst. (SPA), Programme officer (PO), Assistant Director (AD) etc.. 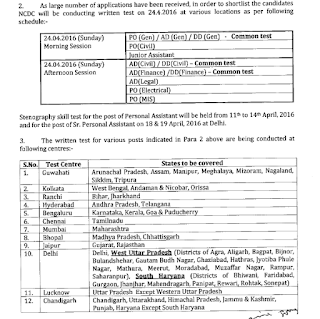 The written exam for JA, PO, AD is scheduled to be held on 24 April 2016. 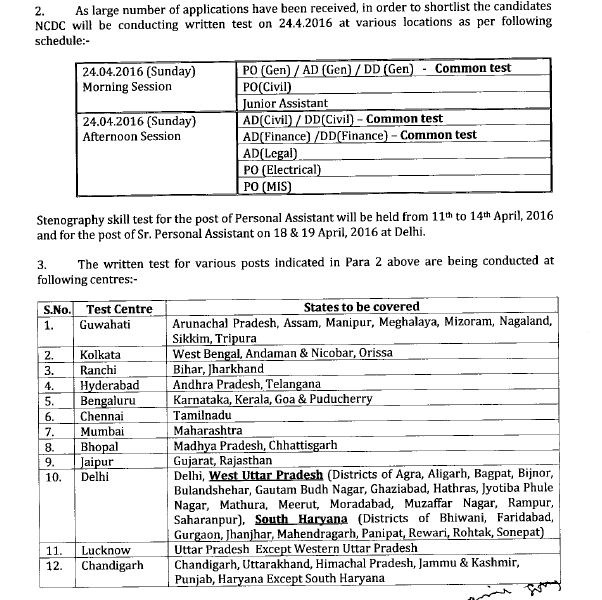 Also Skill test for PA posts is scheduled from 11 to 14 Apr 2016 while for SPA, it will be held on 18 and 19 Apr 2016. Earlier NCDC had completed the process of getting applications. For appearing in this test, aspirants have to download the admit card from below. The Admit card of NCDC had been released now. Those candidates who had applied successfully, can download NCDC Exam Admit card from the direct link given below. NCDC is going to conduct PO, AD, DD, JA post's written exam on 24 April 2016. Also Skill test for PA and SPA is to be held. For that, admit cards are available now. Candidates can download NCDC admit cards from the official website www.ncdc.in via the direct link given below. All the important details like exam venue, roll number, date and time etc. had been mentioned in them. Earlier National Cooperative Development Corporation had invited applications for Dy. Director (DD), Assistant Director (AD), Programme Officer (PO), PA and SPA & Junior Assistant Posts. The written examination consists of multiple choice objective type questions. Questions will be asked from General Knowledge, English, Current Awareness and Aptitude. The candidates can download their admit card from NCDC website from here. The admit card should be printed on a paper and bring at the time of skill test / written exam. No one will be permitted without it. In order to download the admit card for NCDC exam, candidates need to visit the direct link provided here (after release). It will take you directly to download page. Then candidates need to enter their registration no., date of birth, enter registered email id and select post and their NCDC Admit card 2016 will be shown. candidates have to take a print of it.